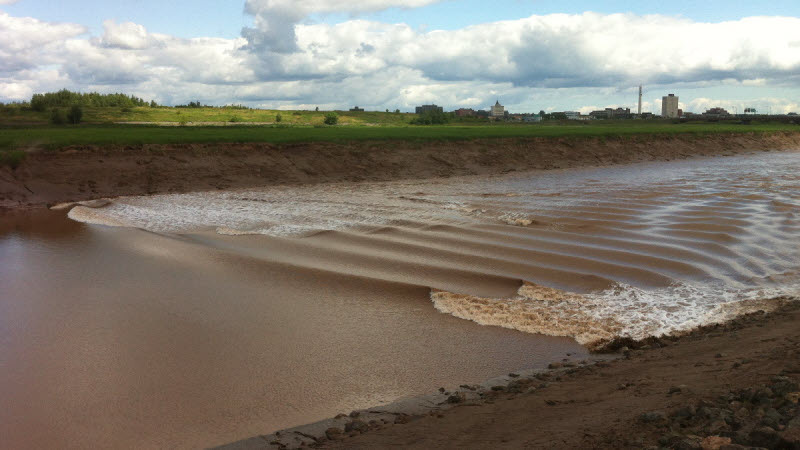 Anyone who has seen the power of the rush of water of the Tidal Bore rushing up the Peticodiac can understand the awesome power that is in constant motion in the Bay of Fundy. The concepts of using the incredible volumes of moving water to generate electricity by turning giant submersed turbines is not new but the technology and drive to harness the tides is getting closer to becoming a reality as a company called Cape Sharp Tidal was scheduled to install this weekend the first of two five-story high, two-megawatt turbines in the Minas Passage. Some community members have opposed the project, calling for better government oversight and science. Bay of Fundy Inshore Fishermen’s Association worries the turbines will harm fish and whales and say the promise of more consultation doesn’t go far enough.He said the association has asked the company to halt installation, remove equipment, and undertake a new ecology study with oversight from the federal Department of Fisheries and Oceans, along with input from industry, community and First Nations representatives. So the project is on hold again for now. Traditional Mi’kmaq folklore states that the tides in the Bay of Fundy are caused by a giant whale splashing in the water. Oceanographers attribute it to tidal resonance resulting from a coincidence of timing: the time it takes a large wave to go from the mouth of the bay to the inner shore and back is practically the same as the time from one high tide to the next. During the 12.4-hour tidal period, 115 billion tonnes of water flow in and out of the bay. The tides in the Bay of Fundy are semi diurnal. Semi diurnal tides are tides that have two highs and two lows each day. 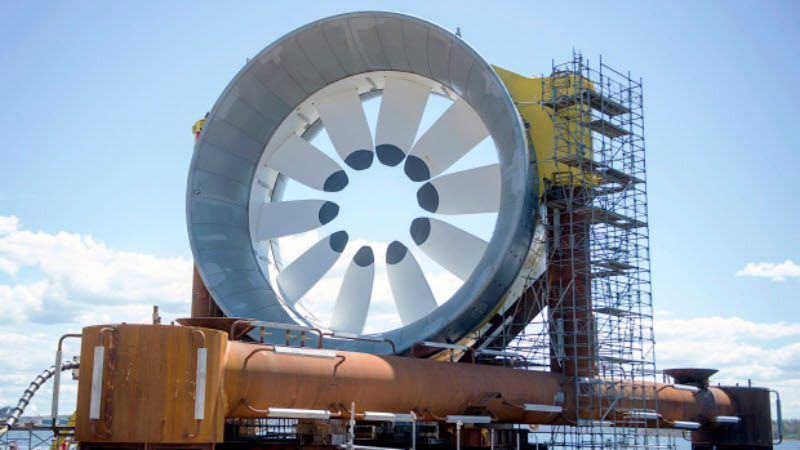 Huge turbines held on large submersed structures may soon be plopped in the waters of the Bay of Fundy to hopefully capture the tidal flow to create electricity…they may also be smashed to bits like toys during a storm…time will tell which way the tide falls! The height that the water rises and falls to each day during these tides are approximately equal. There are approximately six hours and thirteen minutes between each high and low tide. 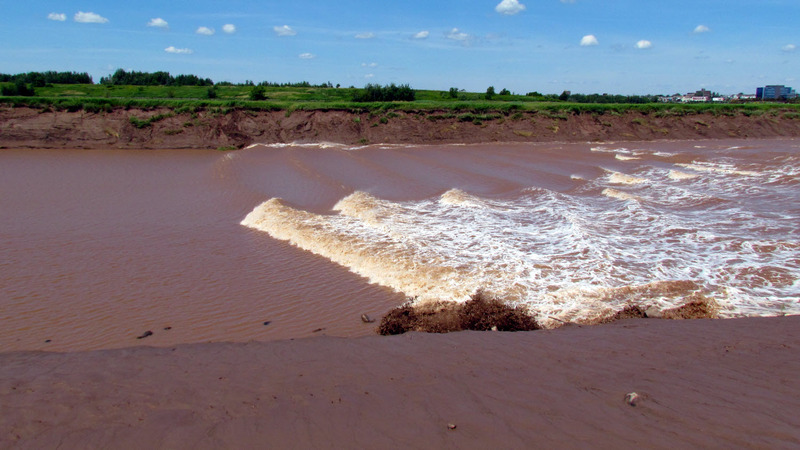 In 2009, OpenHydro — the Irish company which installed the world’s first 1-megawatt tidal turbine in the Bay of Fundy — and its partner Nova Scotia Power deployed a 10-tonne turbine on the floor of the Minas Passage in the Bay of Fundy. 20 days later, all 12 turbine rotor blades were destroyed by tidal flows that were two and a half times stronger than for what the turbine was designed. Oops! Guess the Earth’s tides don’t behave like the chlorinated water in the test tank at the lab boys and girls! The tides are immense and have tonnes of force on a regular schedule but storms and climate change and dramatic events could turn submerged mega-projects into bathtub toys that destroy the environment if nature’s fury is ever unleashed. Maybe best to not be so hungry for power and let the waters rise and fall without humans needing to harness and control every natural wonder in the universe!